For anyone involved with the upper end of the country-house market, 2015 will probably be remembered for all the wrong reasons and only a few of the right ones. ‘Stamp Duty was by far the biggest hurdle of 2015,’ says James Mackenzie, head of Strutt & Parker’s Country Department, who recalls the first quarter of the year as ‘being stuck in no man’s land, while awaiting the outcome of the General Election in May. ‘Following the surprise Conservative victory, we were all expecting to see a surge in the number of transactions, but that didn’t happen. The punitive cost of Stamp Duty [SDLT] was really starting to take its toll and the lack of activity in the London market had a negative effect on the country, with fewer London buyers coming forward. Time and again, people came to view country houses and even make an offer, only to lose interest when they “did the maths” on the real cost of the move.’ ‘Interestingly, as the economy grew during the year and interest rates remained low, people could afford to stay put,’ continues Mr Mackenzie. Even in the Cotswolds, the month of April was ‘totally moribund’ as far as country-house sales were concerned and the summer months were not much better, as London buyers continued to opt for a weekend cottage or a village house in the region, while retaining their main residence in London, reports Atty Beor-Roberts of Knight Frank in Cirencester. ‘It’s been all about land this year and big houses or old rectories with only a garden have suffered as a result. On the other hand, houses with 15 or 20 acres and a couple of cottages are highly sought after and the market for houses valued between £750,000 and £1.25m has been busier than ever,’ he reveals. Although families moving to the country for schools have kept the market ticking over this year, the overall shortage of London buyers in the country has taken the pressure off local buyers.  They have been cannily biding their time, waiting for the price of perhaps the one house they have always wanted to finally come within range. As a result, some houses that had been on the shelf for two to three years found buyers this year, when interested parties concluded that prices were unlikely to fall any further. In most key areas, however, it was September before any real sense of urgency returned to the scene and November before the Chancellor’s Autumn Statement heaped further misery on prospective purchasers of second or additional homes, with the imposition of a further 3% SDLT from April next year. ‘Consequently, vendors of country properties who were sitting on the sidelines have signalled their intention of coming to the market early next year, which should provide a welcome boost to stock levels,’ says Crispin Holborow, country director of Savills Private Office. Despite a lack of trophy houses coming to the open market, it wasn’t all bad news in 2015 and a broad geographical sweep of the houses launched and sold within the year highlights what kind of property sold well—and at what price—in different parts of the country. Clearly, there are buyers out there at every level and, provided their wish lists are covered —and asking prices are realistic— they will still pay over the odds for a house they really want. A case in point was the sale of delightful, Grade II-listed Banks Farm at Bledington, Oxfordshire, a quintessential, four/five bedroom Cotswold-stone farmhouse, with a courtyard of traditional farm buildings set in two acres of gardens, a mile from Kingham station and 4-and-a-half miles from Stow on the Wold. Owned by generations of the same farming family, but in need of modernisation, it was launched on the market through Country Life in May, at a guide price of £1.5m through Strutt & Parker in Moreton-in-Marsh. After 57 viewings and 16 individual bids, it eventually sold in July for £1.9m. Enthusiastic selling agent David Henderson pronounced it his ‘favourite house of the year’. Classic Georgian old rectories in Norfolk don’t normally hang around for long and it was a sign of the times that The Old Rectory at Hardingham, near Wymondham in the south of the county, failed to attract a buyer in 2014. Re-launched through Savills in Norwich at a guide price of £1.65m early this year, it sold for that price during the summer to a Cambridge buyer. 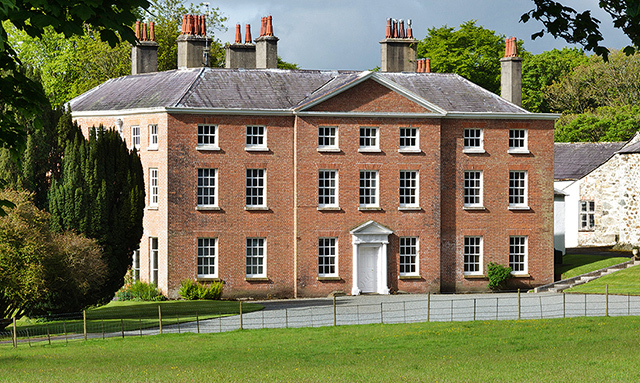 For selling agent Louis de Soissons, the house—built of traditional Gault brick with a hipped slate roof, lovely sash windows, six acres of grounds, a good three-bedroom cottage and no near neighbours apart from the church—‘typifies the quintessential Georgian rectory that so many people desire’. Its 40 acres of surrounding gardens and paddocks were the key to the quick-fire sale of 17th-century Great Easton Manor, near Market Harborough, Leicestershire, says Harborough- based Edward Brassey of Strutt & Parker, who brought the charming, seven-bedroom manor with stabling and outbuildings to the market on July 17 and, after 18 viewings, had the deal done and dusted nine days later. 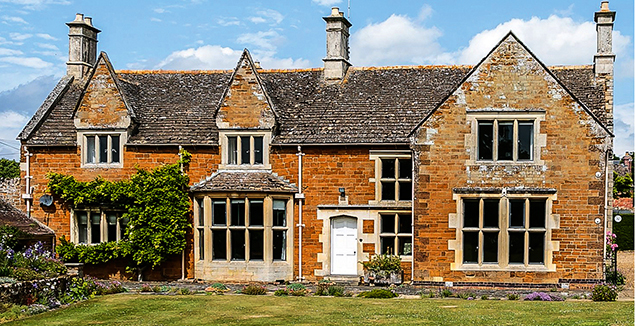 Moving up the gears in terms of price, the same agent also achieved a rapid sale in the case of imposing, Grade II-listed Barham Court at Exton, one of Rutland’s prettiest villages. The impeccable, nine-bedroom, Georgian house, with extensive stabling, a dovecote and a tennis court, set in 11 acres of gardens and paddocks, was launched onto the market on April 17, at a guide price of £2.75m and went under offer in less than a week to a Lincolnshire-based international businessman, who completed the sale in June. 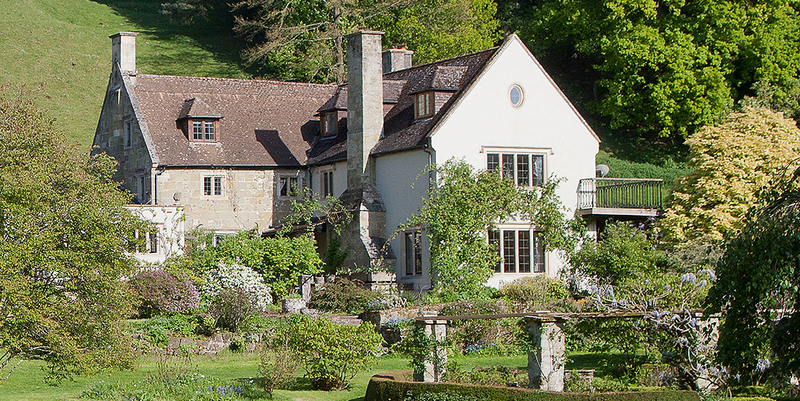 As a longstanding pillar of the Devon country-house market, Richard Addington of Savills in Exeter must have thought he had seen it all—that is, until this autumn, when his first ever Chinese buyer arrived on the doorstep to buy the beautifully restored, Elizabethan Canonteign Manor in the Teign Valley, 10 miles from Exeter, for ‘significantly more’ than its ‘excess £2 million’ guide price. It was one of several diverging trends he has noted in the West Country, which has seen younger London buyers moving away from large country houses in favour of coastal or urban properties. ‘These days, a successful 30-something lawyer no longer wants to live in deepest Devon and trail up and down to London to work,’ Mr Addington maintains. Devon’s loss appears to be Wiltshire’s gain; Charlie Stone of Savills in Salisbury highlights the growing popularity of the picturesque Nadder Valley, which stretches from Wilton in the east to Shaftesbury, Dorset, in the west, as a two- or three-day-a- week commuter destination (via Tisbury) for 30- to 40-year-old Londoners with young families, who may find themselves priced out of areas such as the Cotswolds. 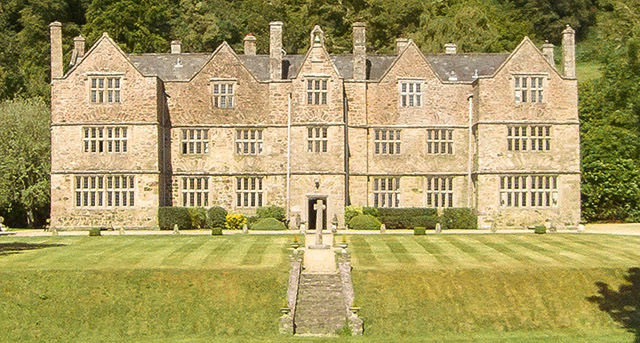 Mr Stone oversaw the sale in July of The Dower House at Compton Chamberlayne in the Nadder Valley, nine miles west of Salisbury, which was launched in June at a guide price of £2.65m and sold a month later to a determined local buyer for ‘well in excess’ of the asking price. Once part of the Compton Chamberlayne estate, the handsome five-bedroom house, originally built in about 1650 and set in its own small valley, came with a pair of cottages, a tennis court and 11 acres of gardens, paddocks and woodland. 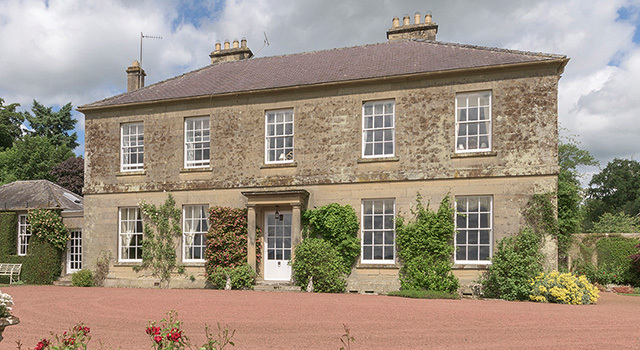 The £3 to £4 million price bracket has been something of a graveyard for serious country houses in the past couple of years, even more so since last year’s SDLT hike. But happy days loomed on the horizon, if only briefly, following the launch onto the market in late May, at a guide price of £3.95m through Strutt & Parker, of the peerless Chettle House in the Cranborne Chase AONB near Blandford Forum, Dorset. Hailed by Pevsner as ‘the plum among Dorset houses of the early 18th century, and even nationally outstanding as a specimen of English Baroque’ and by buying agents Property Vision as ‘a peach’, the magnificent, 14,580sq ft mansion, set in 117 acres of gardens, grounds, parkland and woodland, needed substantial renovation, but still found a buyer in short order—and, reputedly, for more than 50% above the guide price. 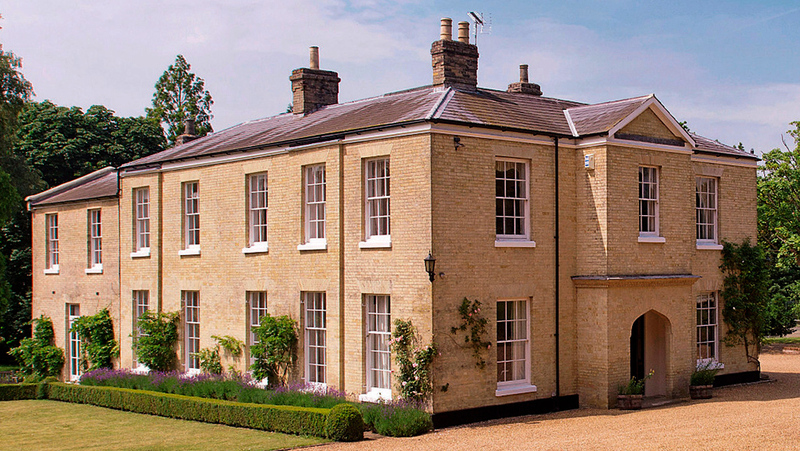 It was a remarkable transaction and, arguably, the country-house sale of 2015. Sadly, it proved to be a rare moment of excitement in an otherwise humdrum year. Another quick shot of adrenaline came with the launch onto the market in September of the idyllic, 327-acre Trewhitt Estate at Thropton, on the eastern fringe of the Northumberland National Park, 40 miles north of Newcastle-upon-Tyne, at a guide price of £3m through Knight Frank, which turned the spotlight on one of the north of England’s most enchanting properties. Described by selling agent Ran Morgan as ‘a wonderfully compact rural estate, totally free from the blights that commonly affect rural property throughout the UK, with spectacular views that haven’t changed in 100 years’, Trewhitt found a buyer within a matter of weeks and against the general run of play in the North. Knight Frank scored another hit with the rapid sale, for the first time in its history, of the scenic, 1,001- acre Plas Gwyn estate, with its grand, Grade II*-listed Georgian house in need of modernisation on the east coast of Anglesey, which launched on the market in August, at a guide price of £5m. The estate was offered as a whole, with sporting rights over a further 1,074 acres of nearby land and mineral rights over 581 acres. 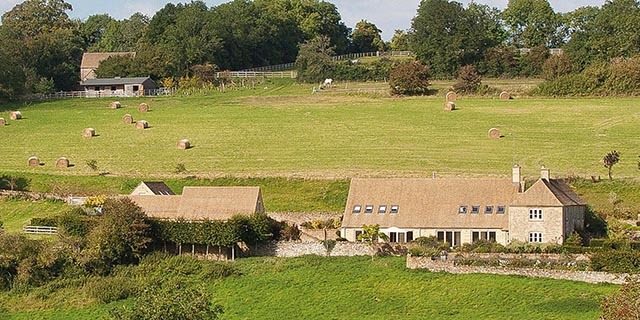 Meanwhile, back in the Cotswolds, Mr Beor-Roberts was happy to spice up a diet of pretty country cottages with the launch onto the market in May of the 44-acre, equestrian Hills Farm at Chedworth, between Cirencester and Cheltenham in Gloucestershire, at a guide price of £3.85m through Knight Frank. 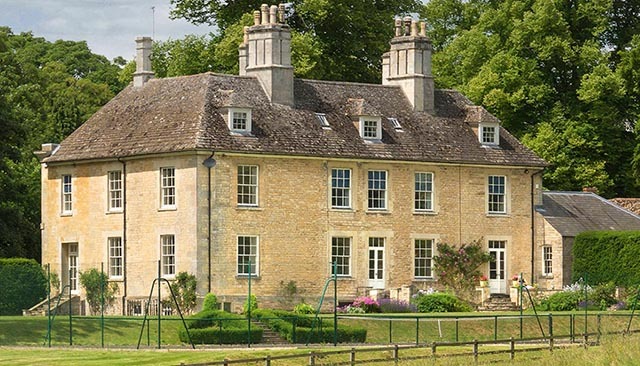 Built of Cotswold stone to the design of local architect Yiangou Architects, the 6,179sq ft main house boasted two main reception rooms, a large kitchen/ dining room, five bedrooms and four bathrooms, along with a two-bedroom guest cottage, a separate party barn and a stable block. It eventually sold in November. Who said all the fun had gone out of the Cotswolds? 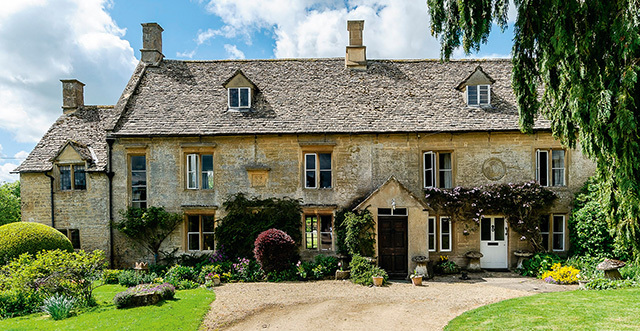 This was followed by Knight Frank’s launch, in June, of charming Monks Cottage at Eastleach, between Burford and Cirencester, at a guide price of £4.5m, following a root-and-branch transformation of the original Cotswold-stone farmhouse into an elegant, 6,000sq ft country home. Ancillary buildings, including a boathouse and a studio, plus 17 acres of parkland, completed the picture and led to a sale in September to a London buyer. 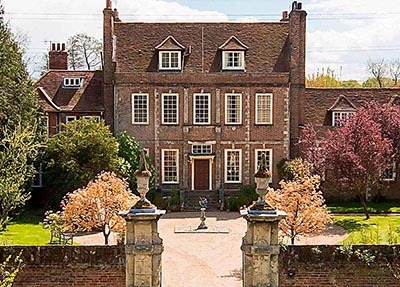 If you thought the image of exquisite 17th-century Byfleet Manor at West Byfleet, Surrey, looked vaguely familiar when it launched on the market, at a guide price of £3.95m, through Savills in May, it was probably due to its regular appearance on your TV screen as the fictional home of Maggie Smith’s character, the Dowager Countess of Grantham, in Downton Abbey. The original sale offer was for the main manor house, with a further four lots—including three further dwellings and a development plot— available by separate negotiation. The property went under offer within 12 weeks, with the buyer purchasing all five lots for £5.9m. The arcane operations of the very top end of the country-house and estates market seemed more impenetrable than ever in 2015, with 30% of all transactions taking place amid conditions of the utmost secrecy. It was more or less business as usual for the big hitters in this field, with Knight Frank finding buyers for a number of celebrity properties, among them, Ringo Starr’s Rydinghurst estate, near Cranleigh, Surrey, launched in 2014 at a guide price of £15m, and Elizabeth Hurley’s six-bedroom Cotswolds home, Ampney Knowle, near Cirencester, came to the market with a £9m price tag in June last year. 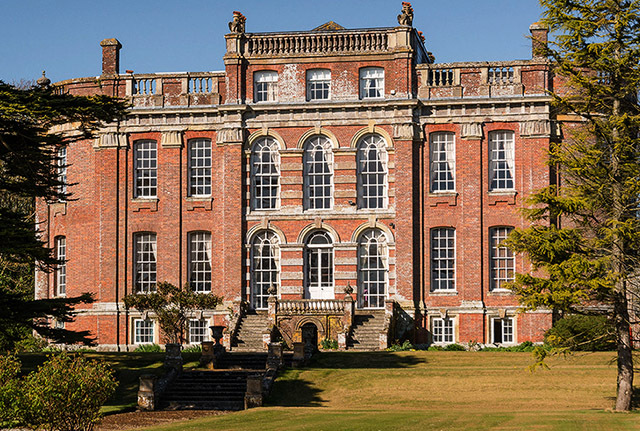 Savills opened the batting with the spring launch, at a guide price of £20m, of the 1,500-acre Somborne Park Farms agricultural estate, near Stockbridge, Hampshire—claimed to be ‘the largest publicly marketed estate in the South during 2015’. The sale attracted interest from UK investors, rollover-funded buyers, farmers, amenity buyers and neighbours and sold within 10 weeks for more than the guide price. 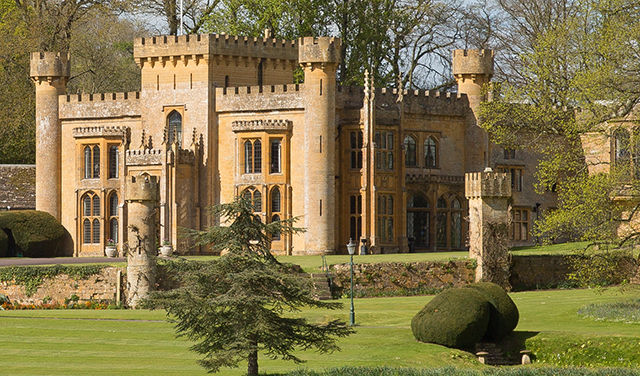 Joint agents Bidwells and Knight Frank riposted with the sale, in August, of the 1,270-acre Compton Castle estate on the Dorset/Somerset border—dubbed ‘England’s most romantic estate’—which launched in July at a guide price of £20m.